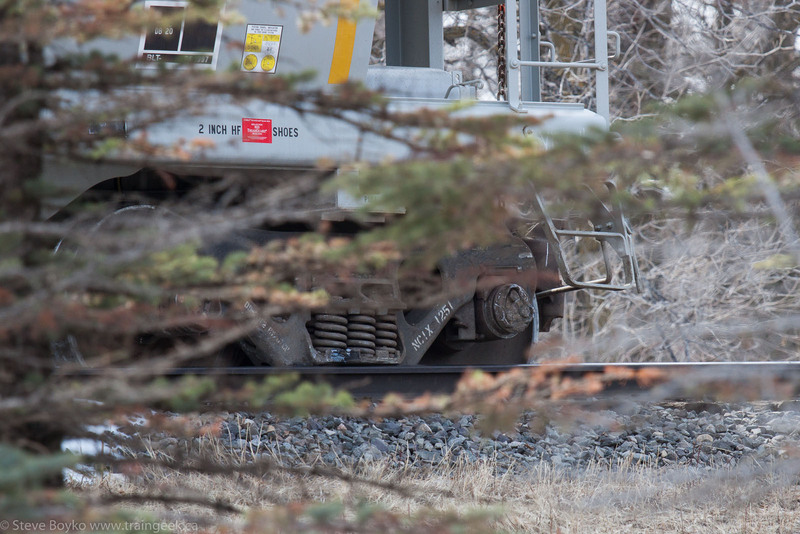 CN 532 derailed about 5-7 cars around 12:55 today, just south of St. Norbert outside Winnipeg. Fortunately nobody was hurt and the cars did not contain any dangerous goods. Crews were on the scene to start cleaning up. I went there later in the afternoon and took some photos. The police had one of the southbound #75 lanes blocked so the equipment could park, and the scene was taped off. I was able to shoot a fair bit from the "good" side of the tape. I had a nice conversation with one of Winnipeg's finest about railfans! This is looking south from the bridge over the La Salle River. 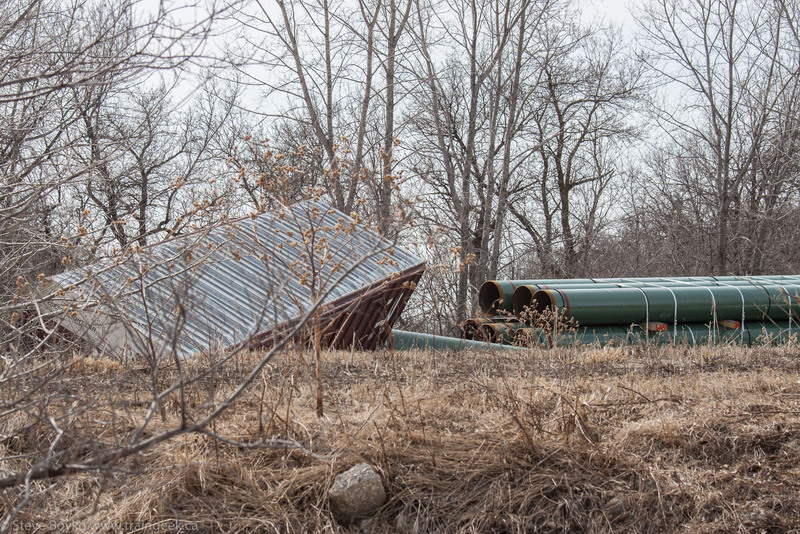 There were a few pipe loads involved in the derailment. 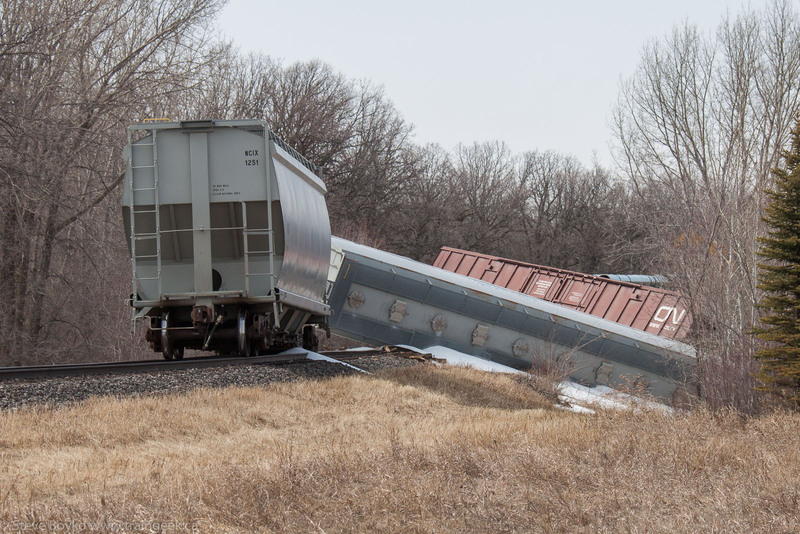 The CN boxcar involved in the derailment. 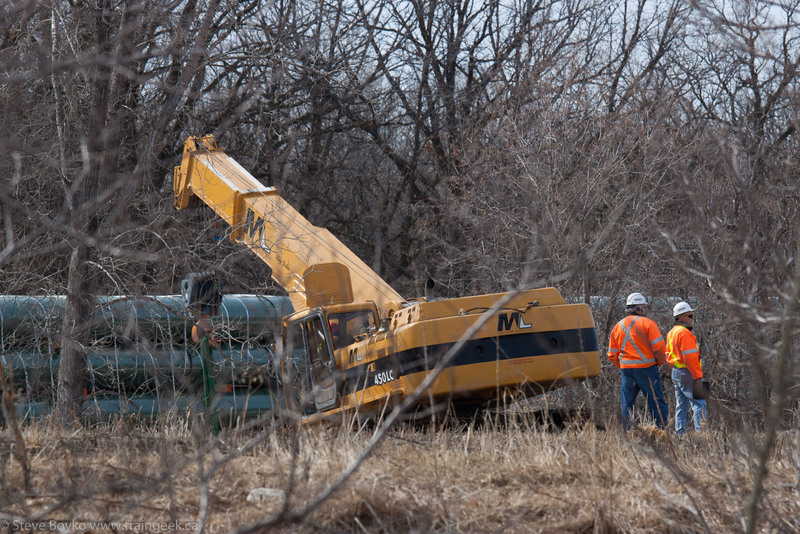 One crane was on site beginning to try to rerail a pipe car. One lane was blocked off. The backhoe was going in to start digging an approach road to the scene. One truck of NCIX 1251 was off the rails. The "big hook" on scene. It wasn't being deployed when I arrived. It was probably waiting for the road to be built. A view from the south end. You can see two hopper cars (with plastic pellets onboard, according to the news reports) and the CN boxcar. The derailment scene is at 49.759548, -97.151342 if you want to look it up on Google Maps. One bystander told me that the rest of the train had been south of the scene, but it was gone by the time I arrived. I presume they continued south to Emerson. I am embarking on a project to photograph as many Manitoba grain elevators as I can this year. So far I have photographed a bit less than 40 elevators but there are a bit over 100 that I have not seen yet. I've created a page / map to track them and I'll be updating that as I go. As part of that I went out on Sunday, February 23 to photograph the grain elevators on CN's Letellier subdivision. You might recall that this sub runs from Winnipeg (Portage Junction) south to Emerson on the Canada-USA border. CN interchanges with BNSF just across the border at Noyes, Minnesota. The line parallels highway 75, more or less, so it's easy to access. I set off with the kids in the morning and drove down to Morris. There are four elevators in Morris, two for Cargill and two for Paterson. I photographed the older Paterson elevator first. To be totally accurate, I had photographed that elevator a week prior when we went down to North Dakota. At that time I did a quick dash in to capture it and then kept on heading south. The new Paterson elevator is at the south end of Morris, and is much, much larger. The new Paterson elevator is interesting in that it is served by both CN and CP. I'll show the interesting trackwork in Morris shortly. The other elevator company in Morris is Cargill. Their old and new elevators are adjacent to each other. Cargill recently announced that they are going to expand this facility, from 10,000 tonnes of storage and 54 rail car spots to 30,000 tonnes and 100 spots. Exciting news for Morris! Now, I promised I would talk about the track layout in Morris. Here is a map I drew to show how the track connects. CN=black, CP=red. 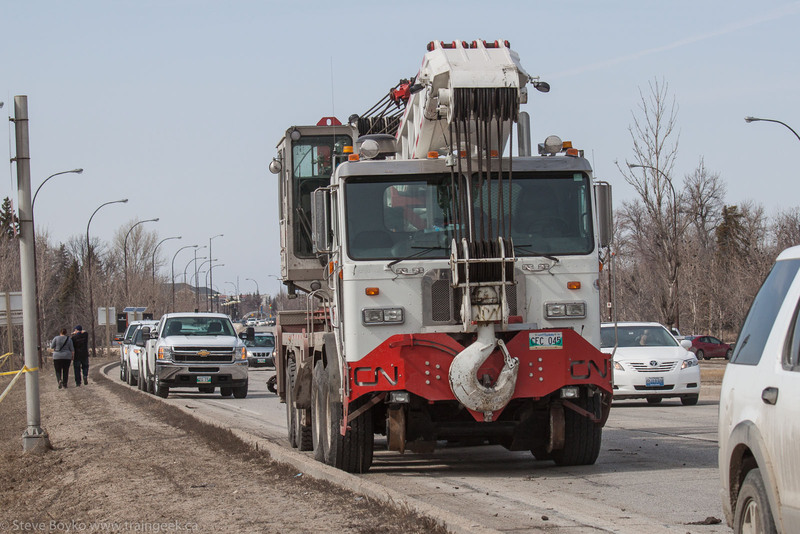 I hope this shows how both CN and CP can serve both Paterson and Cargill. Note that the CN Miami subdivision is just a stub and extends just far enough so CN can use it to shunt Cargill. One interesting thing I saw on the CN Miami subdivision is an honest-to-god semaphore. 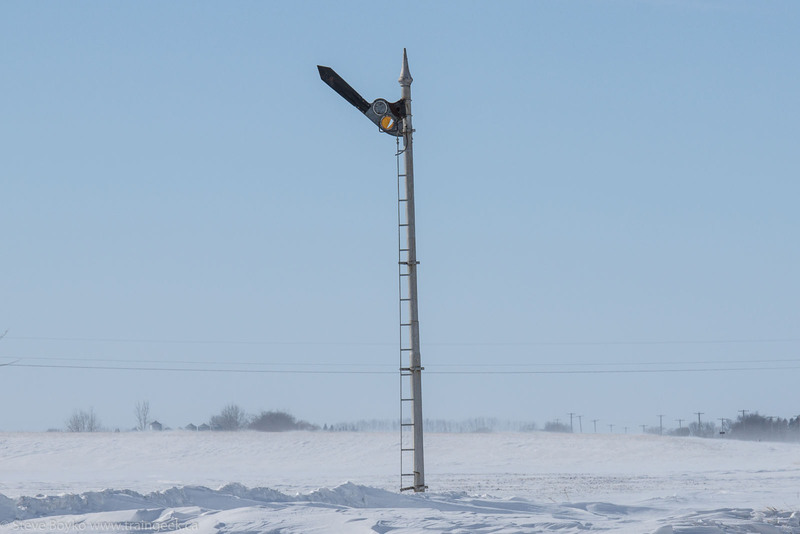 This might be the only "operational" semaphore in Manitoba. The next elevator is the one in St. Jean Baptiste. The writing on the end says "ASSOCIATION CO-OPERATIVE D'ELEVATEUR ST. JEAN BAPTISTE SUCCURSALE No. 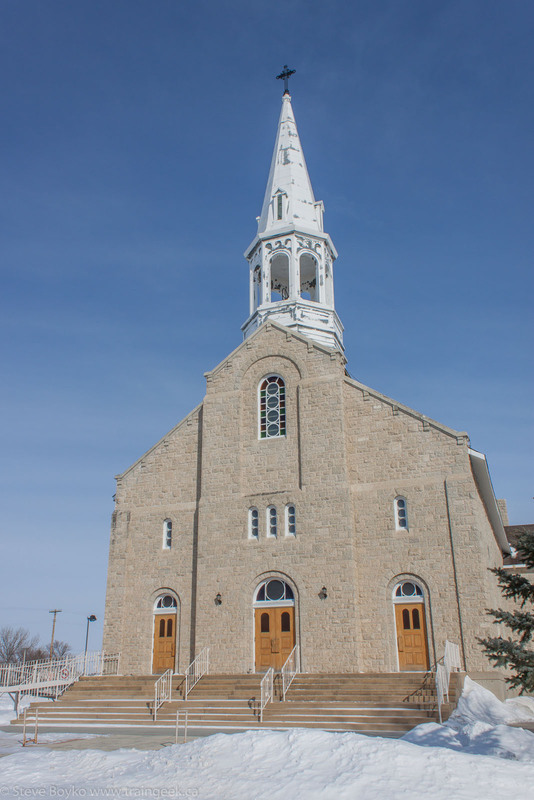 213 SERVICE AU PRIX COUTANT"
St. Jean Baptiste has a lovely, large church. The final elevator on the CN Letellier subdivision is the Pioneer high-throughput elevator labeled "Red River South". It is located just north of the town of Letellier, which had a Pool elevator until its destruction in November 2006. So ends our tour... I hope you enjoyed it, and expect to see a lot more grain elevators here this summer. I happened to see a few trains recently with a black engine trailing, so I thought I'd post about them. 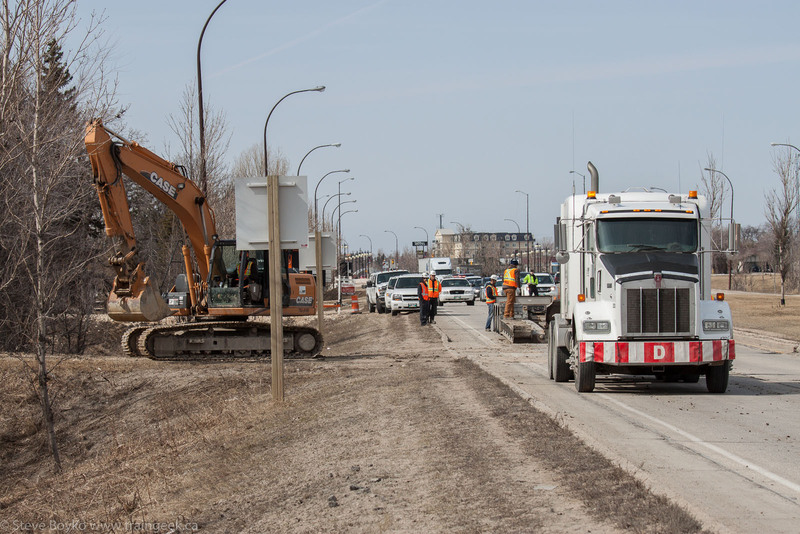 On April 11 I was out on the Sprague subdivision, southeast of Winnipeg, waiting near Lorette siding to see what might come along. Eventually a mixed freight came rambling along, CN 344 with CN 2260 leading. The trailing engine was a Norfolk Southern engine, NS 8700, a GE C40-8. I'm told 8700 went to Melville on X401 and came back to Winnipeg on Q114 prior to this train. I decided to head to the Dufresne grain elevator to shoot it there. I arrived well ahead of the train and got into position. After blowing for the crossing, CN 2260 led the charge past the elevator. Here's the black trailing engine. I love the look of those Norfolk Southern engines. 344 was a general freight train with a lot of potash cars. After that excitement, things were quiet for a while until CN 116 came along. This was an all Illinois Central train, with IC 2712 leading. The black trailer in this case was Illinois Central 1036. After realizing that both trains had trailing black engines, I decided to go back into my photo archives to see what other "trailing black" trains I've photographed. Surprisingly, there have been a lot. 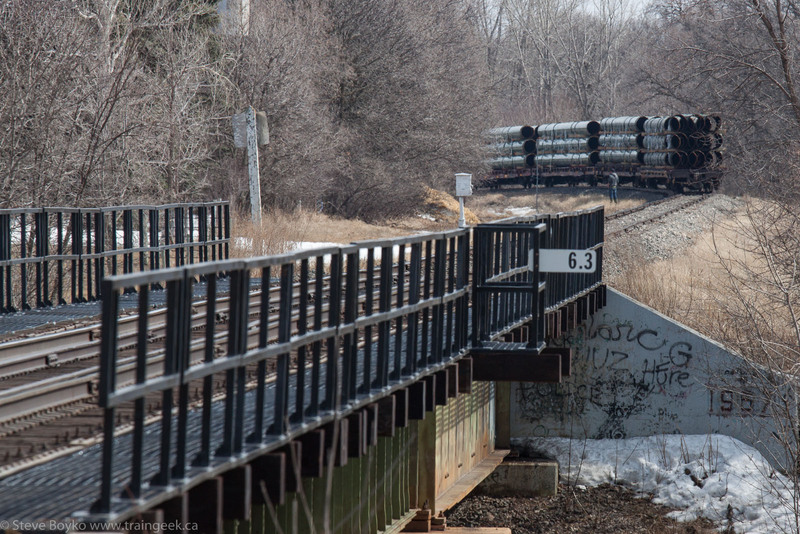 These Illinois Central SD70s have been fairly common around Winnipeg and they do not lead. I found close to a dozen trains with black IC trailers and I'll share a couple here. This was another all-IC train back on November 29, 2011. I took a grab shot of this westbound CN freight on October 17, 2013, with IC 1028 trailing. I'm sharing this one even though it's a bit of a cheat (the black engine isn't trailing exactly), but because it's one of my favourite train photos. This was shot on Louis Riel Day in 2010 (blog entry). 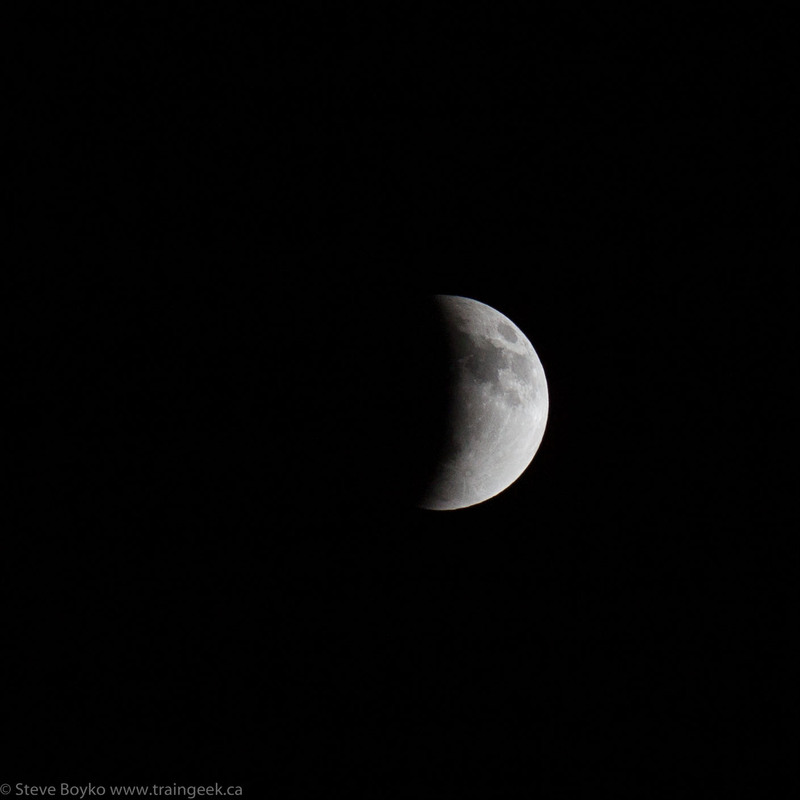 PS hey, did anyone see the lunar eclipse a few days ago? I was crazy enough to get up in the middle of the night to take some photos. 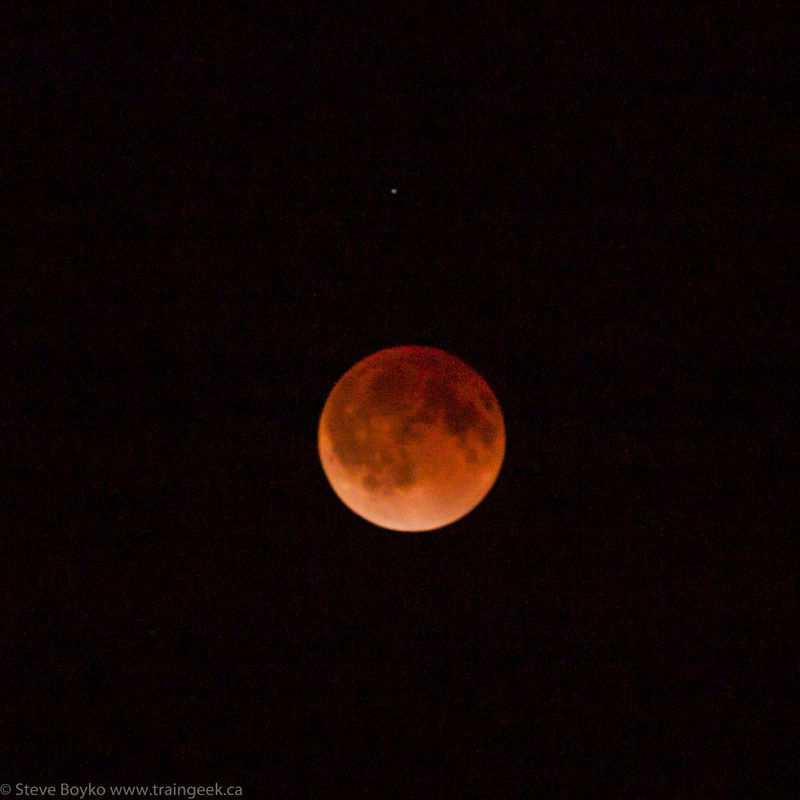 That little dot above the "blood moon" is Mars.